A key argument used to defend the theory of de-extinction is that it will allow humanity to atone for past mistakes. Most, if not all, of the species scientists are proposing to bring back went extinct because of human activities. If we can develop the ability to undo the damage we’ve caused then do we not have a moral obligation to do so? Well, not necessarily! Just because we have the ability to do something doesn’t necessarily mean that we should. There have certainly been instances in which our ‘meddling’ with nature has had only positive results. For example, we wouldn’t have enough food had we not bred crops that grow at a faster rate and with greater yield. 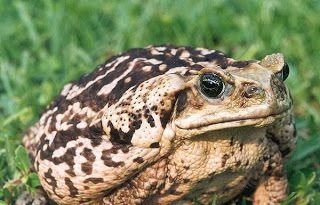 However, there have been many cases in which our attempts to improve our own lifestyle has dramatically backfired, as was the case when we tried to introduce the Cane Toad into Australia. Linked into this matter is the horrendously complex question of how morally right de-extinction is as a concept. Mankind is just another species on the planet, naturally selected to achieve dominance in many environments. Therefore, one might argue that any tools and technologies we have developed are the result of our natural intelligence. 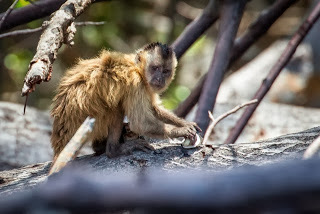 Other species have learned to use rudimentary tools without us gasping in horror; for example, bearded capuchin monkeys use rocks to open nuts. If you follow this thought process logically you come to the conclusion that ‘de-extinction’ is just another natural application of our intelligence. But, of course, your viewpoint on this depends entirely on whether you set humanity apart from other species. The other major argument in favour of de-extinction is the fact that the techniques developed in pursuit of that end-goal could be used to help prevent endangered species going extinct in the first place. The biggest challenge in cloning an extinct species is getting the body of a living organism to accept an embryo containingmostly the extinct species’ DNA. If scientists can achieve this, then one could assume that they could do so with species that are not extinct, but endangered. We would then have a way of artificially boosting numbers of endangered species. The counterpoint to this argument is that such an ability might encourage apathy. Leaving aside the question of our moral right to try and stop species going extinct, would we go to such great lengths to preserve endangered species if we knew we could just bring them back at a later date? Many people would argue that we wouldn’t and that, in trying to be more responsible for the world around us, we might become even less so. A model of a Woolly Mammoth at the Royal BC Museum in Victoria, Canada. Here we come to, in my opinion, the main crux of the argument. We have yet to consider how the revived species and the environment into which it is thrust will cope. For long-dead species, such as the woolly mammoth, the environment in which they lived will have changed drastically in their absence, adjusting to function without them. Regardless of whether they were wiped out by man, these species have lost their place in the world. 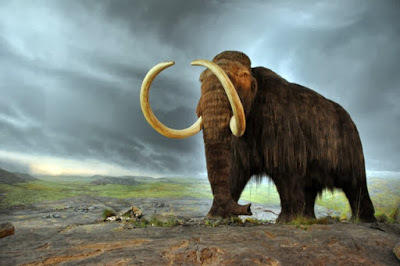 Let’s consider for a moment just a few of the ways in which the habitat of a species such as the woolly mammoth might have changed over time. Firstly, the climate may have changed. This could obviously mean that our de-extinct species can no longer survive in its old habitat. However, even if it could, if the average temperature or humidity has changed, then the range of other species that the environment supports could have changed drastically too. Animal species might have migrated or died off; plants might have died off or suddenly found themselves able to grow where they couldn’t before; and bacteria and viruses will doubtless have evolved massively over time too. This leads onto the second major issue – the food web. If the inhabitants of the environment have changed in the absence of the extinct species, then it has no place in the modern-day food web. Quite frankly, even if the species living in an area haven’t changed, if enough time has passed then they will have evolved to survive without the extinct species, meaning it might still cause massive disruption. It might endanger the indigenous populations by outcompeting them or hunting them in a way they have not evolved to cope with, or it could be threatened with ‘re-extinction’ itself! Finally, I mentioned earlier that bacteria and viruses would have evolved greatly over such a period of time. Well this offers no shortage of complications when trying to bring a species back from the dead. Obviously, a long-dead species’ immune system will be outdated, what with having missed out on potentially millennia of natural selection. We cannot know in advance but it might be that modern-day microbes could wipe out the resurrected species immediately if its immune system could not cope with these new threats. Also, animals’bodies contain massive amounts of bacteria, which help our bodies to function. We could not digest our food as effectively as we do without bacterial colonisation. It is headache-inducing to try and work out the ways in which the body of a member of a resurrected species would respond to colonisation by all of these species that its ‘ancestors’ never encountered. In short, it is very difficult to consider every single factor when introducing an organism into an environment in which it simply does not belong. There are often distant, subtle relationships and interactions between parts of an environment that we cannot anticipate. 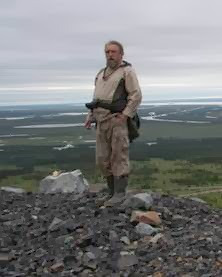 Sergei Zimov surveying Pleistocene Park. In more extreme cases, scientists may try to make an environment suit the extinct species, rather than going about things the other way round. For example, the Siberian steppe that served as the woolly mammoth’s habitat changed drastically at the end of the Pleistocene epoch (roughly 11,700 years ago). Russian scientist Sergei Zimov has, since the 1980s, been reintroducing flora and fauna into an arctic region of Siberia dubbed ‘Pleistocene Park’ in a bid to recreate the ecosystem that was lost millennia ago. This could, ultimately, include providing a home for mammoths. Of course, here, we’re talking about manipulating entire environments rather than individual species. It is difficult to know where to draw the line, if one even believes that a line should be drawn anywhere! In my opinion, the line should be drawn before even taking de-extinction beyond being just a theory. I don’t believe that the potential benefits of such an ability outweigh the incredible and unknowable risks that come with playing God in this manner. As I said before though, I would be very interested to know what you think of this and if you would like to add to my list of arguments. Here, we really have only just begun to consider the ramifications and justifications behind this incredibly controversial area of research. This post, by author Ian Wilson, was kindly donated by the Scouse Science Alliance and the original text can be found here. 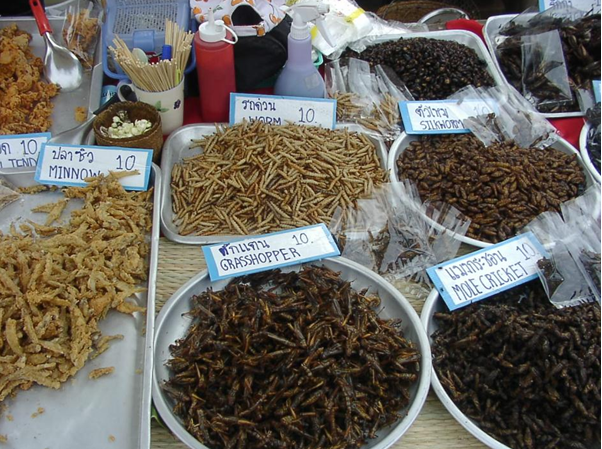 In a recent twitter conversation, I was discussing with some vegetarian friends about their thoughts on eating insects, when tweets turned to the inevitable conversation about why we make the choices that we do regarding food consumption. This then lead to the rather fabulous phrase ‘energytarian’ (@RosalieTostevin take a bow) being coined to define somebody that eats meat but tries to do so in a sustainable manner, which got me thinking about what it really means to eat sustainably. According to this food emissions calculator, the carbon footprint of my food consumption was approximately 2.3 Kg carbon dioxide equivalents (CO2e; the equivalent amount of carbon dioxide in terms of global warming potential). I should point out that I have taken into account the fact that lunch and dinner were both shared with my girlfriend, and also that I have not included the carbon footprint of the spices and protein supplement that I used in these meals. It is also worth noting that these calculations do not include packaging and cooking, and were done assuming that I am based in North America (I am not), but as a basic indicator of my carbon footprint it will suffice. 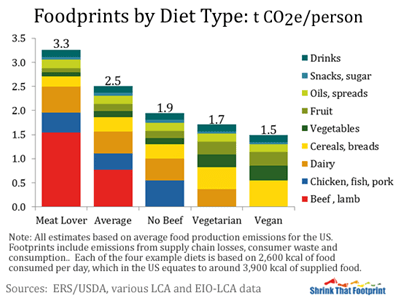 My eating habits seem to sit quite nicely between the ‘Average’ and ‘No Beef’ according to the detailed analysis of carbon foodprints that was carried out by ‘Shrink That Footprint’ (read more about it on this excellent blog post), which seems like a fair assessment. I try to avoid eating red meats more than three times a week if I can help it, but this is not a hard and fast rule. My food diary saw me fall somewhere between ‘Average’ and ‘No Beef’; a position that oddly mirrors that of my physique. There is at least one other major factor that we need to consider regarding eating sustainably, and that is the consumption of water. According to a recent report, it is estimated that it takes over 15 thousand litres of water to produce 1 kg of beef; to put that into perspective many Africans have to survive on 20 litres of water per day. Using tabulated values from a 2013 report published by the Institution of Mechanical Engineers, the chicken curry that I made used up almost 2,500 litres of water in ingredients alone, i.e. before taking into account the water that was used in the preparation and washing up. From this report, red meats would again appear to be a big no-no for any self-respecting energytarian; although chocolate lovers beware, 1 kg of the good stuff uses up over 17 thousand litres of water! It would be tempting to say that all would-be energytarians should stick to a strictly vegan diet, although by ‘simply’ giving up beef you can reduce your carbon foodprint and food-based water consumption by over a third. Food for thought this summer as you boot up the BBQ. 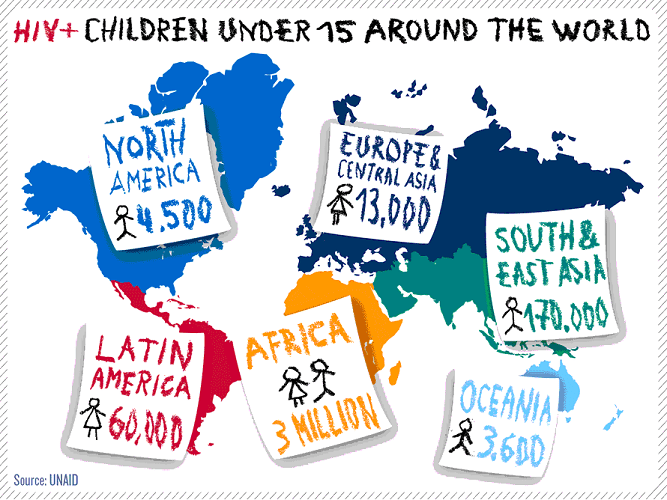 With over 30 million sufferers worldwide, HIV remains the world’s leading infectious killer. The human immunodeficiency virus attacks the immune system, leaving it unable to fight infections, resulting in AIDS. Improving HIV care is one of the top 10 global health priorities. Therefore, when research published last year suggested a baby had been “cured” of HIV; tabloids quickly began to speculate, with some implying the elusive cure may be closer than we imagined. One year on, with similar cases set to be presented at AIDS 2014, the leading international conference on AIDS, what is the significance of this major breakthrough in terms of tackling the large-scale HIV pandemic? In 2010, a baby was born prematurely to a mother whose HIV was only discovered during delivery. With no prenatal care, and therefore a high risk of exposure to the virus, the gutsy call was made to begin aggressive treatment with a combination of three antiretroviral drugs at just 30 hours old. Infection was confirmed soon after and the child remained receiving therapy. Surprisingly, within days the level of HIV had rapidly diminished and within a month was non-detectable. However, the successful therapy was unexpectedly ceased after 18 months as the mother stopped taking the child to scheduled appointments. When the child was finally examined again, at 23 months, she remained free from infection despite not being on HIV medication. At the time of the paper the child continued to be in remission, gaining the title “the baby cured of HIV”. The doctors quickly emphasised the therapy proposed was a “functional cure”. With the child recently beginning to shown early signs of infection, it appears the treatment silenced the virus for a substantial period of time rather than eliminating it. In reality, cases involving mother-to-baby transmission are rare. Standard HIV pre-natal treatment can lower the risk to 2%. Therefore in areas where there are a significantly higher number of cases, such as Sub-Saharan Africa, the main factor is the sub-standard levels of health care rather than the need for new treatment. Is a new, miraculous treatment now available? The therapy itself wasn’t novel as it used readily available antiretroviral drugs; the “novel” aspect of the therapy was the early approach. This is already known to be advantageous as early aggressive treatment is thought to prevent viral reservoirs forming. HIV reservoirs are what hide the virus, making it resistant to the both the immune system and medication, and form within hours of infection. 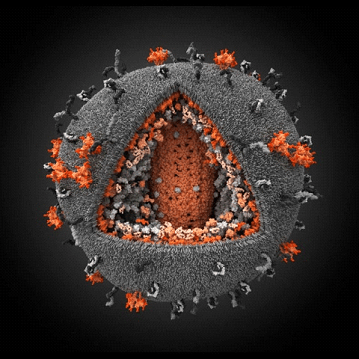 Can adults now be cured of HIV? There has been speculation that the immune response of a newborn is more suited to cope with HIV than an adults. Not only are babies immune systems immature, resulting in a milder reaction to the virus, but they lack the memory “defender” cells that are the target of the dangerous viral reservoirs. However, last year several adults were reported to have undergone a similar “functional cure”. Having undergone early antiretroviral treatment, 14 out of 70 patients remained virus free for at least 3 years, following cessation of therapy. This suggests that 5%-15% of HIV patients could eradicate the virus through early treatment. Early treatment plans would not benefit current sufferers but could help tackle new cases. While treating the virus as soon as possible seems like an obvious idea, it appears it would be difficult to implement. Not only do 1 in 5 sufferers remain unaware they are infected, but the stigma associated with HIV means many people are reluctant to get tested. Therefore, before getting excited over the potential of early treatment regimes, the bigger challenge of identifying the infection promptly needs to be addressed. The “functional cure” has provided hope and opened new areas for scientists to explore. Importantly, it strengthened the idea that early treatment is vital. However bigger social and development issues, involving improving health care in poorer societies and ensuring early identification, need to be addressed before the findings can be translated into the “HIV cure” that has been widely speculated. Persaud, D., et al., Absence of Detectable HIV-1 Viremia after Treatment Cessation in an Infant. New England Journal of Medicine, 2013. 369(19): p. 1828-1835. Saez-Cirion, A., et al., Post-Treatment HIV-1 Controllers with a Long-Term Virological Remission after the Interruption of Early Initiated Antiretroviral Therapy ANRS VISCONTI Study. Plos Pathogens, 2013. 9(3). 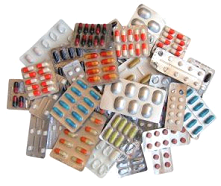 The decline of the antibiotic – taking medicine back to the dark ages? After being struck down with a particularly nasty chest infection, I initially put off going to see the doctor and instead opted for lots of rest, fluids and self-medication. After suffering at home for a few weeks with no alleviation of my symptoms, I eventually decided enough was enough and went to see the doctor. I was subsequently diagnosed with pneumonia and prescribed antibiotics to treat the infection, after which my symptoms finally began to ease. Concern over recent news articles discussing the demise of the antibiotic due to over- prescribing. It is the second of these reasons which seems to be a particular cause for concern. The evolution of disease-causing bacteria, leading to antibiotic resistance, is a concern which has been high on the scientific agenda for decades. However, the media are only just starting to catch on to the stark reality that faces us. David Cameron has recently taken notice of this impeding issue, referring to the problem as ‘taking us back to the dark ages’. Cameron has called for a review into microbial resistance and has called for drug companies to invest in finding the next generation of antibiotics. But is this too little too late? If our bodies become infected with foreign bacteria our internal immune system (white blood cells) act swiftly and efficiently to stop the spread of infection – usually before it has the chance cause noticeable symptoms. More often than not, our bodies are able to cope with such an attack without intervention. However, sometimes our bodies become overwhelmed and are unable to cope on their own – this is when we need to seek help from antibiotics. By interfering with the bacterial cell wall or the contents within – a process which destroys the bacteria (bactericidal). By slowing down the growth of bacteria that can cause illness or disease (bacteriostatic). Thereby, ensuring that the bacteria is no longer able to multiply and infect us. 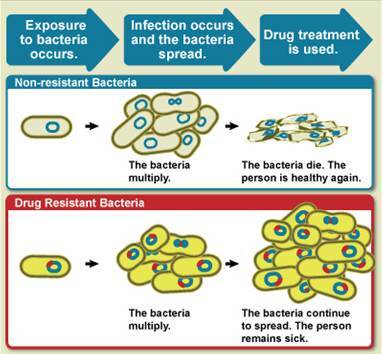 MRSA superbug showing resistance to antibiotics as the bacteria (yellow) overwhelm the white blood cells (red). The development of antibiotics peaked in the 1950’s, after which there was a sharp decline in their development – no new classes of antibiotics have been developed since the ‘80’s! This is perhaps because there is not much money to be made from discovering new forms of antibiotics, so the pharmaceutical industry tend to focus on other, more lucrative, areas of research. But how exactly does resistance to these drugs occur? When our bodies become infected with bacteria, there is a small chance that some of the bacterial cells show a natural resistance to antibiotics and therefore remain unaffected by the drug. This resistance could be due to a mutation that occurred by chance, or could be as a result of evolution – effectively the bacteria out-smarts the drug. These few remaining resistant bacteria survive, and rapidly reproduce so that the body becomes overwhelmed by this resistant strain. Drug resistance can then be transferred between bacteria through reproduction, physical connections between different cells and also through viruses called bacteriophages. Antibiotic resistance is accelerated by over-use in the health-care and farming industries. Which is a growing concern, as many patients fight with doctors to be prescribed antibiotics for all minor ailments without considering the consequences of using them unnecessarily. Bacteria presented with 4 different types of antibiotic. 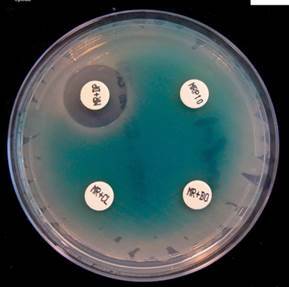 In three cases the bacteria is resistant to the antibiotic and in one case only the drug is sufficient to treat the bacteria. Antibiotics are also heavily used for intensive farming. With such a demand on farmers to produce lots of cheap meat, animals are housed in cramped conditions where infections are easily spread. Of course to prevent this spread, copious amounts of antibiotics are often used. This overuse facilitates resistance. Resistant bacteria are then able to spread from farm animals to people via our water supplies, which can then spread further from person to person by physical contact, coughing and sneezing. Now that we know the extent of the issue of antibiotic resistance, what can be done to tackle the problem both in the short and long term? Currently, drug-resistant superbugs such as MRSA and C.difficile cause 5,000 deaths a year in Britain. This has been controlled to some extent by implementing more stringent hygiene procedures in hospitals such as frequent hand washing and anti-bacterial hand scrubs. However, the occurrence of other resistant bacterial strains are on the rise; E.Coli cases have risen by two-thirds over the last few years. Aim #1 To understand antibiotic resistance: to collect as much information as possible about the mechanisms that bacteria use to become resistant and to understand how the resistance spreads. Aim #2 To conserve our current antibiotics: by improving hygiene in hospitals and by educating doctors and nurses about the issue of resistance, and encouraging them to only prescribe antibiotics when absolutely necessary. Aim #3 To encourage the development of new antibiotics: by providing more incentives for pharmaceutical companies to invest in antibiotic development. In terms of addressing antibiotic resistance in the long-term, several approaches can be taken. Firstly, we need to tackle the issue of over-prescribing. Currently, there are no diagnostic tests that allow doctors to determine whether infections are caused by bacteria or virus. So, developing a test that could determine the basis of aninfection would help doctors give the correct prescription. Secondly, drug companies need to create new classes of drugs to tackle bacterial infections. Thirdly, we can try to reduce the use of antibiotics in farming. Lastly more research needs to be conducted into a new innovative approach to tackling infections which uses viruses to treat bacterial infections. A combination of over-prescribing and the lack of development of new antibiotics means that these drugs are rapidly becoming less effective in their fight against infections. There is the fear that, in the very near future, these drugs will cease working completely and simple things to treat such as cuts and flu will be likely to make us very ill and even cause deaths. With no suitable alternatives to antibiotics we could be looking at a very bleak future for medicine. With all of this in mind it is clear to see that the pharmaceutical and medical industry needs to make huge investments into developing new classes of antibiotics to fight these super-resistant bacteria. Alongside this, doctors need to be sure to prescribe these precious drugs sparingly and patients need to be careful not to rely on them so much for minor ailments.